If you’re looking for a new pendulum before the conference this October please stop by the shop to find that special pendulum. The definition of dowsing varies for each of us. I think of dowsing as energy that comes from the subconscious. A calm mind, a loving heart and the use of simple dowsing tools gives us access to a wealth of information that we may not have otherwise known. Through our own stillness, focus and dowsing tools we can access optimal health, locate objects, find water, minerals and locate power spots on our property. ( more on dowsing for power spots in another blog post ) In addition, we are able to change energetic frequencies from being detrimental to beneficial. The list of benefits and possibilities through the use of dowsing are endless. Anyone can learn to dowse; one only needs to have an open mind and clear intentions. The history of Dowsing is thought to date back 8,000 years. Ancient artworks in China and Egypt to the North African Tassili caves, murals of pre-historic art depict images of tribespeople with forked sticks that appear to be dowsing. Could it be true that tribespeople used these tools to navigate through life during times when survival was crucial? Dowsing may have been used to locate water and land suitable and beneficial for their families and future generations. In the middle ages, dowsing or divining was very much a taboo subject and seen as occult. It was best during that time period to keep such a practice hidden. Luckily, today we need not worry anymore about being burned at the stake or tortured for using these tools. At this point I will share a little of my personal journey into dowsing. Many years ago a friend offered a short intro on how to use a pendulum. After witnessing movement right away in my pendulum, I became both excited and afraid. Needless to say at the time, fear and lack of understanding won and I did not pick up a pendulum for a long period of time. 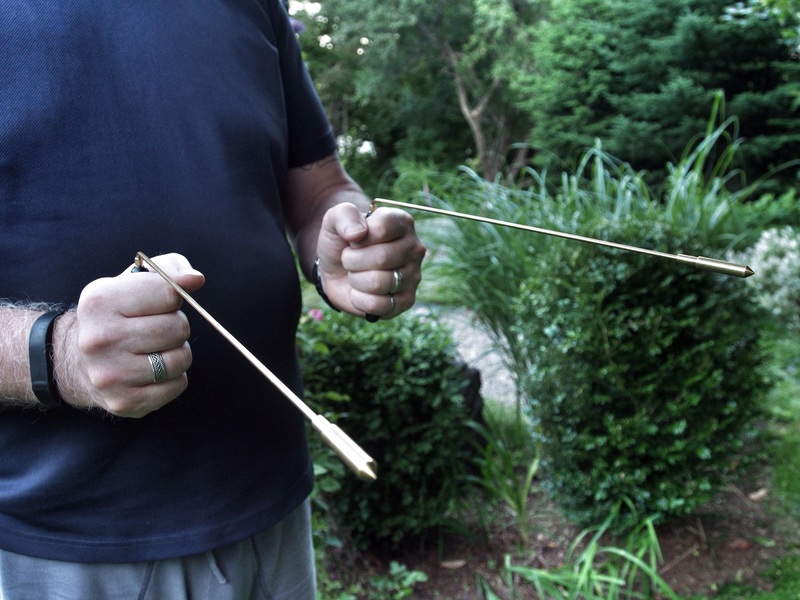 Several years later an invitation to visit Charles Hubbard’s farm, in Nova Scotia became yet another introduction to dowsing, this time using L-rods made from a coat hanger. I had no idea at the time just how much this visit would change my life. The moment I held the L-Rods in my hands, they moved from one side to other. I doubted myself, thinking perhaps it was the wind or my shaky hands that made them move. I decided to shift my attention to being calm by walking slowly and deliberately around the yard. As a result, I was able to establish my yes and no with the rods. Spending the day with Charles Hubbard opened a door to many new ways of gardening and using dowsing was one of those ways. With Charles’s encouragement that same year I attended The Atlantic Dowsers Conference. This proved to be another amazing turning point in my life. It was there I met many like-minded people who used dowsing as a tool to connect with energy. In the days to follow my morning ritual included a 30-40 min meditation to clear and calm my mind in preparation for my dowsing practice. I still used the same yes and no communication with my L-Rods but began using charts and other communication methods with my pendulum. This meditation practice gave me time to take note of any thoughts, images and messages I received during meditation and through dowsing. As I continued to practice and gather more information, I also attended a workshop with Joey Korn at his place in Augusta, Georgia. This workshop gave me the opportunity to learn more about dowsing and the blessing process he uses. He describes the process of changing energy by simply blessing the person or object. 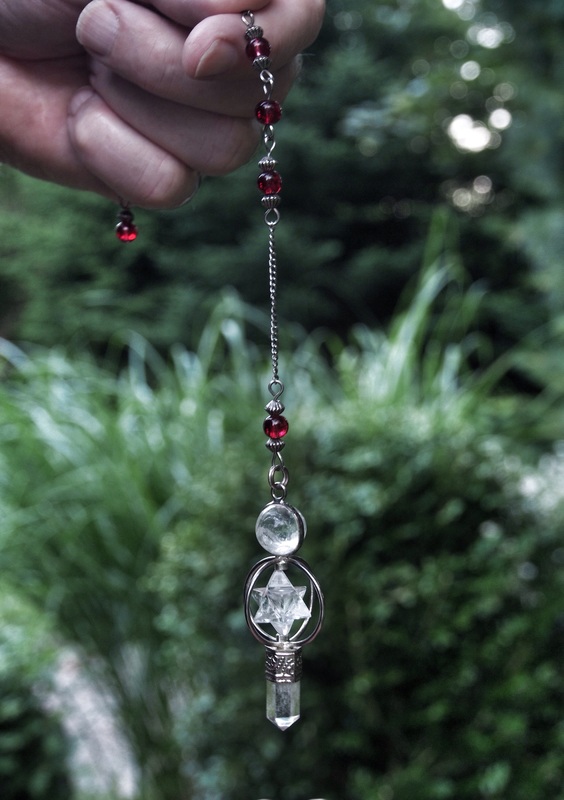 Joey states, “Any detrimental subtle energy that we find with dowsing can be made beneficial with a blessing. It’s all about intent.” This blessing process can be accurately measured by trying the experiment below with a glass of water. Remember to keep the blessing simple. 1. Almost anything can be used for dowsing. Fingers, arms and the swaying of your body while in a meditative state all are connections to our higher self. Pendulums, bobbers, L-Rods, forked sticks and a simple needle and thread can also do the trick. I have a small collection of pendulums and L-Rods. The choice I make to use certain tools over others depends on the day and time as to what feels right in my hands. 2. 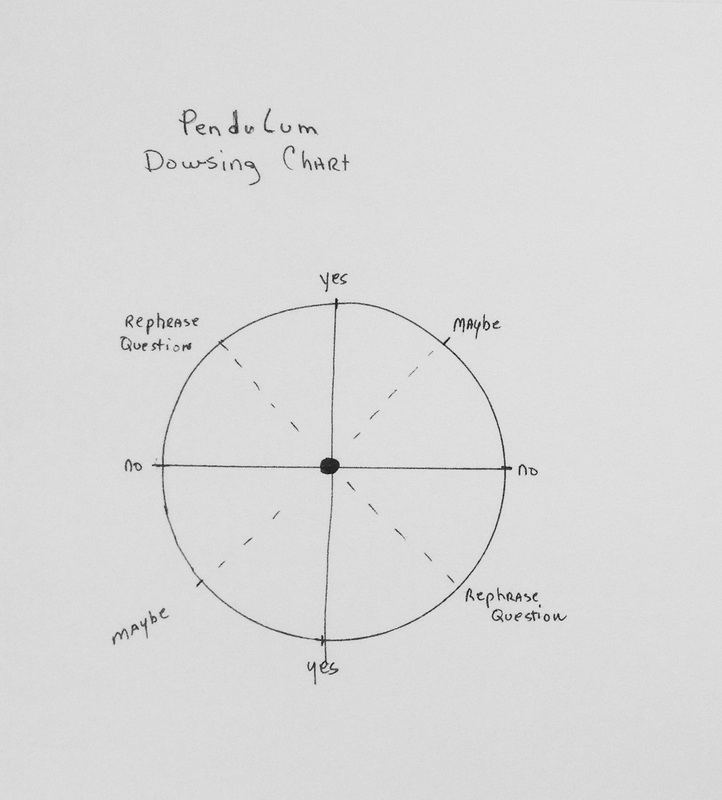 Establish a yes and no with your pendulum or dowsing rods and stick with it using the chart I have drawn below. Eventually, you may wish to use advanced charts and other forms of communication but for now keep it simple. My yes is up and down as though i’m nodding my head yes, my no is back and forth the same as the motion of my head when answering no. If you feel the response to your question is not accurate the pendulum will shift to the word on the chart to rephrase your question. You may wish to make up your own charts as you progress in dowsing but for beginners this is a start. The black point in the centre of the chart is a resting point for your pendulum where you begin. 3. I can’t stress enough the importance of taking a few moments to clear your thoughts and quiet the mind. This facilitates your ability to focus on the question and receive accurate answers. 4. Always ask permission before you begin to dowse. The question most often used is, “May I, should I and can I dowse at this point and time.” This is important. We may have days when we are tired and not feeling our best. This will affect our ability to dowse and obtain answers to questions. If you receive a no it only means not right now. Try again later when you are feeling more focused and physically rested. 5. Questions. The best way to form your question is to keep the question simple and to the point. It could be helpful to write the question out first on a piece of paper to make sure it is exactly clear and to the point. 6. Always use your dowsing practice for the good of all. I am a firm believer of what we give out we get back. Light attracts light, darkness attracts darkness. Never use this gift to harm anyone. Dowsing is not a game of magic. Our purpose is to create harmony and wellbeing. There are many blessings online for water you may wish to look up or make up your own blessing. Start with a tall glass of water and a pair of L-Rods. Set the glass of water on the table or kitchen counter. – Take a few moments to centre yourself and with your rods pointing in search position ( both pointing ahead ) ask for permission to dowse the glass of water and wait for the answer. – Step back about 4 to 5 ft from the water on the counter. At this point you might begin by “asking” the rods to open when you reach the energy field of the glass of water. move forward slowly take notice where the rods open. After the water blessing step back again 4-5 ft and repeat the same question as above. Wait for the rods to respond. They may open immediately. If there is enough space in your kitchen to walk backwards continue to do so slowly to observe the energy field of the glass of water. Notice if the energy field has expanded further than it did in the beginning. My personal best on youtube for getting set up in dowsing, clearing and programming your pendulum. David Cowan – Intro into Spiritual dowsing #1, #2, #3. This is a 3 part video I highly recommend. Also, a very informative website that I’ve come to love is, http://www.healingnexus.com, Kathy Wilson is Past President of the Canadian Society of Dowsers, co-founder and CEO of Healing Nexus. This website has a list of ongoing events on dowsing with internationally known dowsers.